Chrissy Teigen came for Ivanka Trump, and this time, she referred to her as someone without empathy; she also said unsavory things about President Trump. English poet, Percy Bysshe Shelley, once said that the greatest force for moral good is imagination. 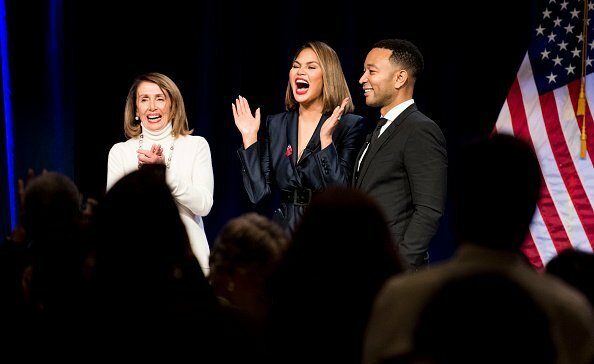 To reiterate those words, the Democratic Party for their yearly retreat invited celebrity couple, Chrissy Teigen and John Legend. The duo was the special guest, and before an audience of Democrats, they had an interesting discussion with political commentator and “Elle” contributor, Melissa Harris-Perry. The television host's first question to Teigen was on child separation when asked how it affected her as a mother, the mother-of-two said it is a hurtful thing to watch, and accused President Trump’s administration of inflicting pain. The 33-year-old said Ivanka who claims to be an advocate for women and their kids is putting up posts about her son and daughter when other children are getting separated from their parents. She added that it shows the first daughter is emotionally stunted. Still, on a roll, Teigen said the billionaire President have a group of nasty followers who send her messages, and she had to stay away from social media for a while as a result. As the discussion progressed, Harris-Perry asked what word she thinks women should use more, and the Democrat replied “F*** you,” after which she apologized to the Speaker of the House, Nancy Pelosi. The celebrity added that it goes beyond saying it, but it should be a mindset. Legend joined in to emphasize the point; he said there are times when you don’t get to say it, and all you have left is to walk away. Ivanka maybe under fire now, but last August, she said family separation is a low thing to do, and she is strongly against children getting separated from their parents.